A novel about a bomb squad that defuses magical weapons? Yes, please! Mirah Bolender’s debut novel, City of Broken Magic, utilized this fascinating premise to deliver a gripping adventure last year. And now she’s back with the second book in the Chronicles of Amicae series, which Tor Books will release on November 5th. 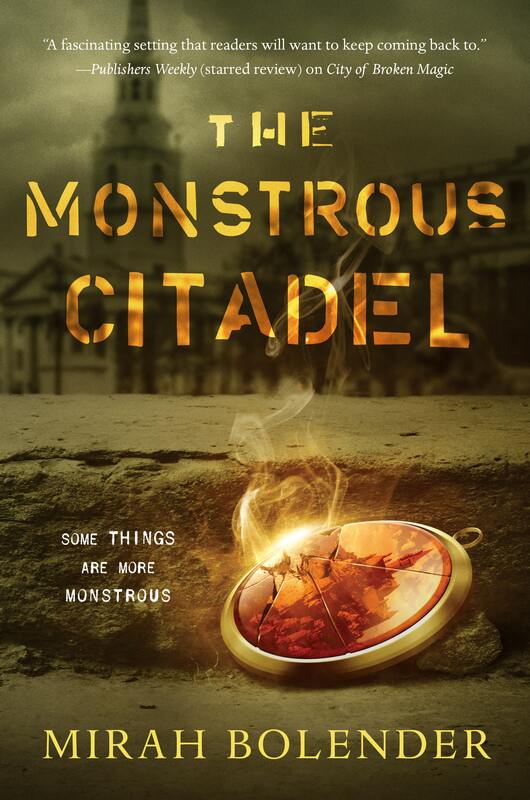 Titled The Monstrous Citadel, the novel follows Laura Sinclair, a member of the elite Sweeper squad, as she continues to protect her city from sinister threats. And Rex, the City of Kings, who breed their own kind of monstrosity. Laura and Okane must go to Rex to reclaim the secret weaponry that keeps Amicae safe and come face to face with a horrifying truth about the Rex and their designs on all of Orien’s cities. 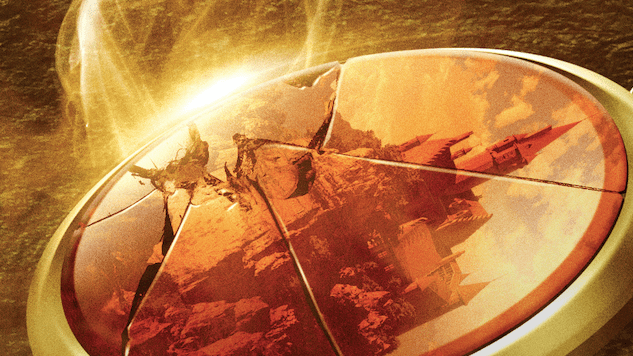 We’re excited to exclusively reveal the cover for The Monstrous Citadel, featuring art by Tony Mauro. While you have to wait until November to read the novel, you can read an excerpt from Chapter 2 today! Check it out below, and click here if you’d like to pre-order Bolender’s book. Laura rolled her eyes and pushed the door open. Chill morning air blew against her face, but she barely felt it. She was too focused on the woman standing directly in front of her. Laura didn’t recognize her, but the woman certainly knew her. She pushed herself up from her previous recline against the banister and smiled. The tone rang sweet, but the words felt loaded. God, could this be one of her critics, come to badger her in person since they couldn’t get her on the telephone? Laura’s trepidation shattered at the new voice. Charlie had stepped out of his apartment—presumably leaving for university—and now looked at them both with a sullen expression. She’d rather deal with someone screaming half-truths than an outright backstabber. Luckily the woman followed without further prompting. “This isn’t about titles and you know it,” said Charlie. His face went red in anger and embarrassment, but it kept him quiet long enough for Laura to escape. Upon leaving the Cynder Block, the woman led her down one of the nearby roads. It was a route Laura knew well, even if she no longer frequented it. She’d taken this path for three years of high school. She knew where other children came in off the branching streets, knew which stores opened earliest to entice students who’d skipped breakfast, knew which canal-spanning bridges were steepest. School was in session today, so they were soon crowded by high schoolers and book bags. A pair of girls walked in front of them, whispering the same ghost story about the Sylph canal that Laura had gossiped over in her time on this path. Between this and the discarded brochures, she was in a bittersweet, nostalgic stupor and almost missed it when the woman spoke again. The familiarity of this place no longer comforted her. She’d meant to make a critic think deeper. She clearly made the wrong decision. The woman’s expression plunged into something entirely chilling. She said nothing more but kept walking. It wasn’t enough of a dismissal for Laura to feel comfortable leaving, so she kept walking too. Before them loomed the Naia Canal bridge. The canal and accompanying Naia Street were an industrial thoroughfare. Small boats chugged up and down the waterway, and the bridge rose high to accommodate them; its height gave a good view over the cars of Naia, and it was this that made Laura pause. Students complained and circled past her on the bridge, but she didn’t pay attention. One of the buildings on Naia was a tall, unassuming office complex, but she’d seen its façade printed in a newspaper: the Dead Ringer’s headquarters. Police surrounded it, but they weren’t raiding it. Their backs faced the building and they looked out into the crowds as if searching for something. Anyone who’d lived in Amicae knew about the Mob Action Resolution Unit. The roughest members of the police force, they’d been turned loose on the lower Quarters with the sole mission of breaking up the mobs. They’d attacked anyone remotely connected, and used any tactic—coercion, torture, outright murder—to take someone off the scene. They ruled with an iron fist until the Silver Kings rallied all the mobs under their banner. The MARU could fight scattered mobsters, but the united front overwhelmed them. Mobsters made the MARU’s actions look like child’s play. They hunted down every last member, picked them off one by one with increasingly gruesome tactics, and everywhere they went they left circles. A circle like a target. A circle like a noose. They drew it on victims splashed by acid, slapped it on cars and along the MARU’s frequent routes, hung it over baby cradles and gifted wreaths to unwitting wives. For months Amicae had been tormented by circles on every street, and the MARU broke under it. Most died by the mobs’ hands; some took their own lives; the few who survived were either too injured or too afraid to return to the force. The mobs dispersed quickly afterward, but the point was made. Amicae knew who held true power. For a long time the Council had spread the rumor that Sweepers were the current incarnation of the MARU, but as far as Laura knew, the mobs knew better. She and Clae had never been drawn into their fights, and circles never appeared at their door. “I’m not allied with them!” Laura snapped. Fire and glass burst from the upper floor of the Dead Ringer office, with force enough that the very air trembled. Students screamed and ducked. Back, whispered something far away in Laura’s mind. Back, she thought in reply. She reached the boat’s side and clung there. She looked back up at the bridge; would the woman have a gun, too? The woman stood at the rail, knife still in one hand. The students fled, tripping in their haste to get away from her, but she remained totally calm. “You should work on your escapes. That lacked any sort of grace,” she called. She pulled an object out of her purse and threw it. It spun and fell with a clunk at Laura’s feet. It was a wreath of flowers woven tight against a painted backing, like the ones used at graduation ceremonies or funerals. As pretty as the flowers were, Laura could only see the circle now. She glowered at the woman, snatched up the wreath and snapped it in half. The woman threw back her head and laughed. Another bomb went off on the Dead Ringer’s second floor. Laura flinched on instinct. When she opened her eyes again, the woman was gone.